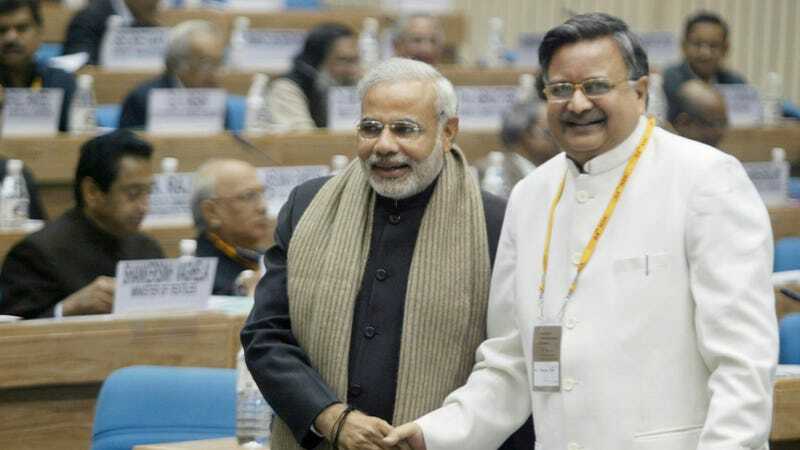 Indian Prime Minister Narendra Modi (then the chief minister of Gujarat province), and Chhattisgarh Chief Minister Raman Singh, seen at the 54th National Development Council meeting in New Delhi in 2007. India’s right-wing, arch-nationalist Bharatiya Janata Party (BJP) is using government-subsidized cell phones that have been handed out to millions of people as a campaign tool, the New York Times reported on Sunday, with the BJP using a $79 million free-phone program in the state of Chhattisgarh to appeal directly to voters. Reading from a script that pops up on their screens, the callers ask the recipients if they are happy with the device and the mobile service, and also poll them on their satisfaction with other government programs championed by Mr. Singh. According to the Times, the phones distributed via the program also have a photo of Singh’s face as the default background image, as well as come preloaded with apps promoting news releases from Singh and fellow BJP politician Prime Minister Narendra Modi. Using the apps in question prompts the user to share their contact lists as well as other personal data with the BJP, the paper added. A previous piece in the Economic Times noted that while “almost all” major political parties in India have invested significantly in data analytics and social media operations, the BJP had invested more time and effort than others. That report noted that ahead of the May 2018 Karnataka Assembly elections, BJP workers and volunteers created at least 23,000 chat groups on WhatsApp, an encrypted chat service and Facebook subsidiary that has become a major political tool in some countries which either lack widespread wireless infrastructure or expensive data rates see residents turn to wi-fi networks (such as Brazil). Alex Paul Menon, who runs the Chhattisgarh Infotech Promotion Society, which in turn runs the phone program, told the Times that it was not designed for political purposes and was instead a form of “nation building.” He also told the Times that his agency does not share user data and that the apps that came on the phones were selected by a state committee. According to the Times, polls run by the state show recipients are using the phones for standard purposes—speaking with relatives, browsing the web, and texting—but interviews with a number of locals showed “they were barely using the phones,” which are allegedly poorly built and suffer from a number of technical issues and limited data rates. However, the paper also added that the BJP has also rolled out a similar program in the state of Rajasthan, and it is under consideration elsewhere.